Analysis of developments in financial markets, economics and public policy geared towards anyone with a stake in these issues......and, yes, we all have one. The non-financial U.S. media has paid intermittent attention to the slow boil debt crisis unfolding across the Atlantic, leaving most Americans aware something is awry, but hazy on details. Being that I ate and drank developments in the crisis during its first 18 months while working as an analyst in the region, and have continued to follow the incremental measures put forth by officials (the famed kicking the can down the road), I will attempt to address questions I often field by providing an overview on the origins of the crisis and potential fallout, especially regarding how it may impact the U.S. economy, including identifying somewhat ignored transmission channels that would have dire consequences. Additionally, a few conclusions will be drawn about what policy makers in other regions of the world might learn from this expensive…but instructive…teachable moment. As with so many things concerning western civilization, it is good to start with Greece, especially as its inclusion into the Eurozone encapsulates the structural flaws in the foundation upon which the Euro project was built. The primary misstep was to create a monetary union without a corresponding fiscal union, meaning non-aligned tax and expenditure policies of the constituent governments. As has been painfully illustrated, it is near impossible to have one without the other, especially in a challenging economic environment. 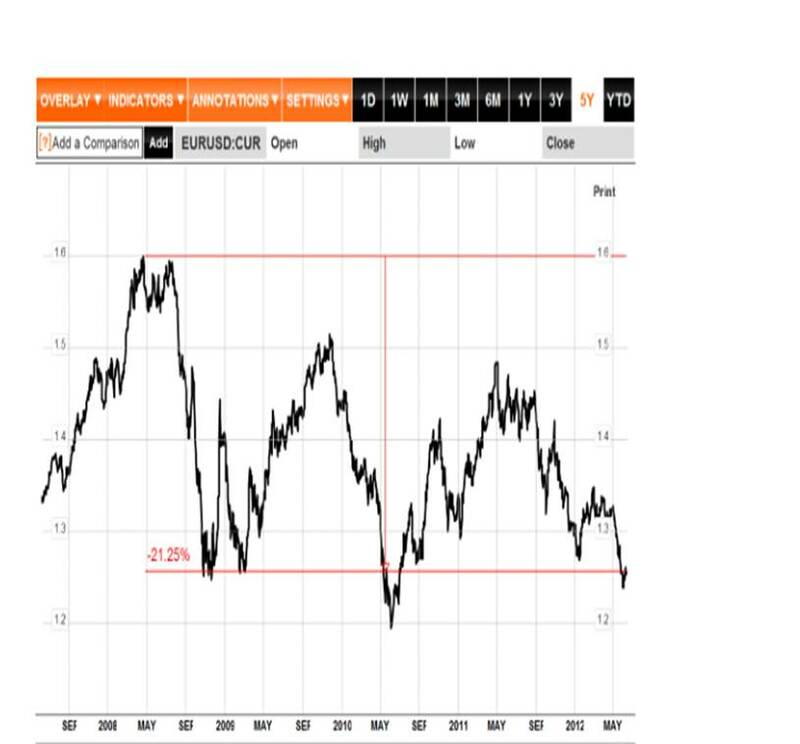 Prior to the introduction of the Euro in 1999, members of the soon-to-be Eurozone had divergent economic structures and risk profiles. Several countries had what could be kindly described as suspect reputations. Consequently, the bond market priced the debt of these nations at a discount compared to their more disciplined neighbors. As the launch of the common currency neared, investors assumed (always a dangerous word) that by ceding monetary sovereignty to the European Central Bank (ECB) and adhering to the parameters delineated in the Maastricht Treaty, all member nations would be a model of fiscal restraint. Gradually, the risk premium attached to members’ sovereign debt compared to ultra-safe German bonds dwindled negligible amounts. Intoxicated with cheap access to credit markets, consumers and governments in peripheral Europe went on a shopping spree. Greece was the worst transgressor. It possessed the toxic combination of being a nation of tax cheats and having a bloated public sector that accounts for over 40% of GDP. This is a recipe for chronic budget deficits. Worse, the public sector’s dominant position in the economy, best described as crony capitalism rather than old-school socialism was the antithesis of a system that could unleash the vaunted animal spirits associated with an unencumbered growth-producing private sector. But grow Greece did. It accomplished this by tapping credit markets and giving everyone on state payrolls and entitlement recipients (i.e. a large swath of the populace) juicy wage and payment increases. So what of the Maastricht criteria (government deficits to GDP limited to 3% and public debt to GDP of 60%) meant to curtail such behavior? With the help of clever London bankers, swaps agreements (think shell game) obfuscated the excesses. And anyway, the larger Eurozone members were creeping up over their limits a well. Debt is not a bad thing when the capital raised is used build infrastructure and take other steps to increase the competitiveness and productivity of a nation, especially through catalyzing exports. Greece, however, did not deploy its capital in this manner. Think flat-screen televisions and new German cars. The party ended with the onset of the global financial crisis in 2008. As with any recession, government revenues plummeted due to lower tax receipts while at the same time social safety net expenditure sky-rocketed. In 2009 Greece was forced to restate its debt position to over 100% of GDP. 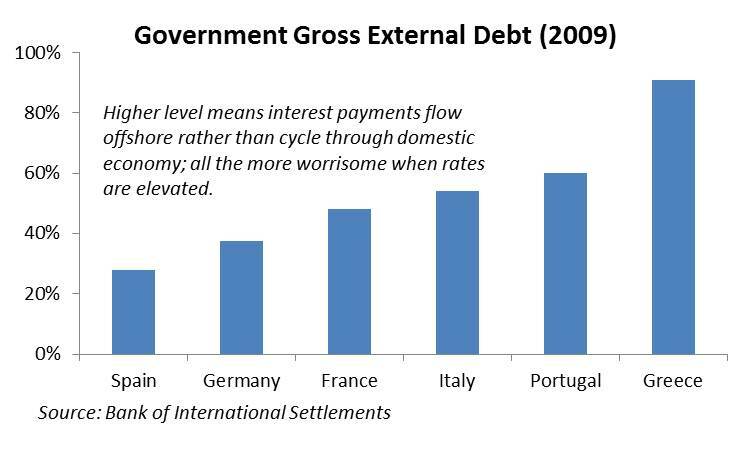 Worse, much of that debt was held by non-Greeks, meaning the massive interest payments were being funneled to foreign bond investors rather than recycled into the domestic economy. Usually when a country is overburdened with debt that it cannot pay off due to an uncompetitive economy it has three choices. It can default, thus sticking it to bondholders. But that understandably ticks off global credit markets, making it all the more difficult to tap them in the future. It can devalue its currency, leaving local-currency denominated debt holders out to dry should they have to convert those into another currency. This step has the added detriment of importing inflation through suddenly much more expensive foreign goods. Alas, Greece gave up its own currency, so this option is not even on the table (unless the nuclear option of leaving the Eurozone is considered). Lastly, a country can undergo a painful fiscal adjustment, which is a nice way of saying deep wage and entitlement cuts. In all three scenarios, the proverbial man on the street gets a raw deal, with his quality of life taking an immediate hit. At least with the retrenchment option, bondholders are made partly or entirely whole, meaning credit markets may come calling again should the austerity program prove a success. If Greece does the not-so-unthinkable and leaves the Euro, aside from the astronomical upfront costs of creating a new currency and defaulting on all Euro-denominated debt, it would have very little to gain on the upside. A major benefit of currency devaluation is to make one’s products more internationally competitive, and thus ride an export wave back to prosperity. But unlike Argentina with its soybeans and Russia with its crude, both of which were able to rebound from financial crises by catching the recent commodities bull market, Greece has little of value to export. Kalamata olives are mighty tasty, but there is not enough demand in the entire world for those to pull Greece out of recession. Labor costs, which have outpaced most of the Eurozone’s other members since 1999, only make matters worse. 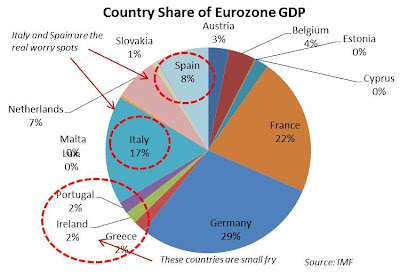 As catastrophic as the Greek situation sounds, the country accounts for only 2% of Eurozone GDP, as do two other bailout recipients Ireland and Portugal. The Eurozone can afford these rescues. The question has been: can it afford to fund a rescue of Italy or Spain, other sickly countries that are the monetary union’s third and fourth largest economies respectively. We shall now find out as Spain has just requested an EUR 100 billion rescue of its banking sector. Each of the other so-called PIIGS’ (Portugal, Italy, Ireland, Spain & Greece) tribulations is unique. Ireland famously cut taxes to attract foreign investment, thus earning the moniker, The Celtic Tiger, but later took a cue from across the ocean and went on a debt-fueled real estate binge. The ensuing bust saw the government nationalizing nearly all the banks (remember the axiom: lousy bank debt becomes lousy sovereign debt). Spain had genuine pent up housing demand given historically high mortgage rates. 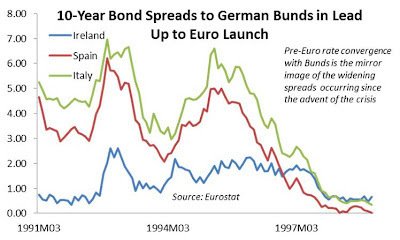 The adoption of the Euro saw rates dip to Teutonic levels, enabling the country’s youth to finally move out from under their parents’ roof before the age of 35. As with Ireland, this rational growth was followed by the less logical kind, again in the form of speculative real estate development. Testament to this is evidenced by miles of empty concrete hulks along Mediterranean beaches, many of which, ironically, were marketed to Irish investors. Spain’s overall debt level is favorable compared to its peers, but that may change as the country is set to nationalize the recently consolidated lender, Bankia, which holds massive real estate assets on its books. 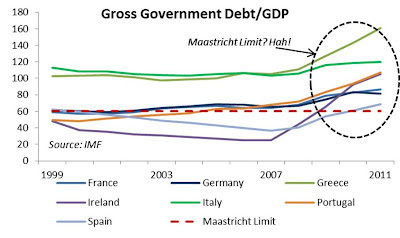 Italy, by contrast, has a debt to GDP of over 100%. One bright spot…liberally using the term…is that much of its debt is held by domestic investors meaning the hefty interest payments stay on the peninsula. Its problem, however, is the country’s notorious sclerotic bureaucracy, paltry tax collection, intransigent unions, and corruption, all of which contribute to lackluster economic growth. Say a prayer here for Prime Minister Monti. The mechanism through which these risks could blow up the entire Euro experiment is the continent’s banking system. There are two ways which this might occur. 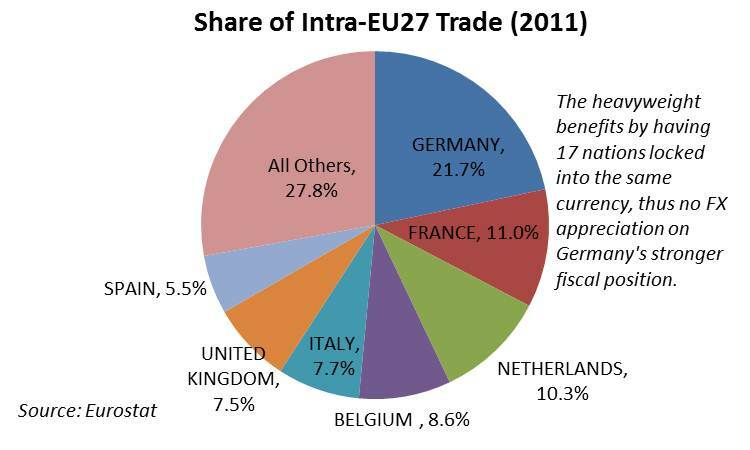 First, closer integration of national economies meant that banks were able to operate throughout the European Union. Subsequently, the large banks of northern Europe, namely French…but German lenders too…extended massive amounts of credit to southern governments and enterprises. Write downs of these loans (which have already occurred with Greece), would dramatically lower the capital cushions of these banks, forcing them to raise additional equity or seek funding from their governments to make up for the capital shortfall; a necessary step to provide confidence for depositors. Such write-downs would also curtail lending activity, which would tap…well slam…on the brakes of an already teetering economy heavily dependent on bank financing. To a certain extent, time has ameliorated the possibility of this outcome as the incremental measures have bought banks time to partially lower their exposure to troubled regions. This hold true as well for American banks aiming to limit their European exposure. The other source of contagion is a good old-fashioned bank run. Should Greece exit the Eurozone and its citizen’s Euro-denominated deposits be converted to reconstituted… and dirt cheap…Drachmas, Italians and Spaniards would fear that their savings were at risk too, thus causing them to make withdrawals en masse. This scenario would effectively shut down the banking system and very likely the entire debt-dependent economy. Another cause for depositors to rush for the ATMs is the write-downs of lousy loans, something the banking sector has been slow to do. As these assets are marked down, they would eat into the bank’s equity which forms a safety cushion for deposits. The larger the volume of write-downs, the greater the possibility of depositors jumping into defensive action. This outcome was averted in Ireland by the government stating it would back all liabilities (bonds and deposits) of its banks. This dramatic move forced the government’s net debt to jump from 42% of GDP in 2009 to 96% by 2011, and was the catalyst for the country seeking its bailout package. Here the self-perpetuating spiral of doom: Domestic banks are among the largest holders of their respective sovereign debt. As economies slow, loans go bad and real estate projects go bust, the potential for write-downs increases. Again remembering that crappy bank debt usually finds its way onto the sovereign ledger thus diminishing the government’s own credit profile. As a result, the prices of its bonds sink. And where do many of those bonds reside? On the balance sheets of local banks. Marking the value of that debt down further erodes the capital of banks as well as the market’s confidence in the their bonds, putting the institution on even shakier ground. That in turn raises the expectation that the government will eventually absorb the banks liabilities…..and the cycle continues. The lone reason this has yet to occur is the ECB’s two-stage program of providing three-year loans to governments, allowing them to roll over debt for that period without having to go to market, and therefore buttressing the value of sovereign bonds. Without this program….on top of a recessionary environment and government revenues shrinking….this whole house of cards may have already tumbled. This weekend’s action regarding Spain illustrates the connectivity between the banking sector and sovereign debt. Several regional “caja” or savings banks loaded with rotten real estate loans were consolidated into one giant new national bank, cleverly named Bankia, loaded with rotten real estate loans. The notion of the larger entity being able to more effectively manage the dodgy loan book and attract private capital proved fleeting. The central government has had to effectively nationalize Bankia, a proposition it cannot afford given the program of deep cuts Madrid is already undertaking to get its fiscal house in order. Hence the need for the EU rescue package. 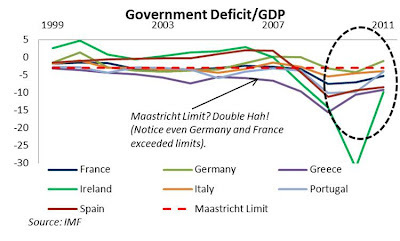 A variety of solutions have been put forth: issuance of common Eurozone bonds, rigid EU, rather than national, oversight of the financial sector, and tighter fiscal integration meant to control government tax/spending policies. The reality is that in order to achieve the stated goal of keeping the Eurozone together, in the end, the German taxpayer will be left with the bill. 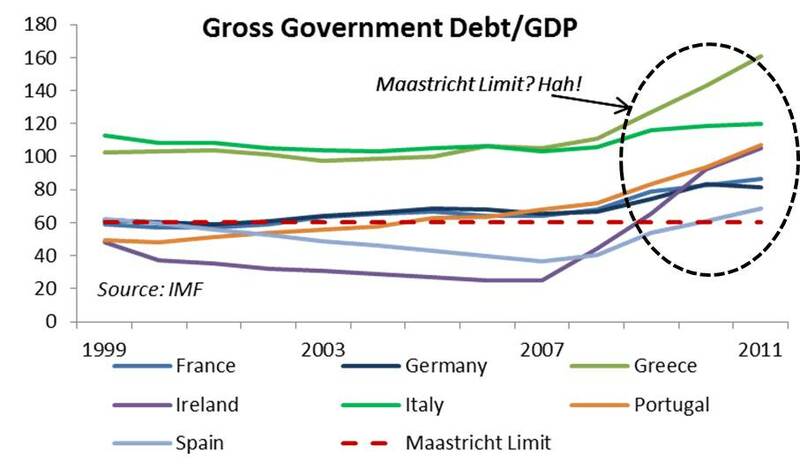 In aggregate, the Eurozone’s gross public debt to GDP was 88% in 2011, slightly better than that of the United States. Arguably there is room to afford an all-encompassing bailout, but it would entail transferring the accumulated savings of the north to the profligate south. 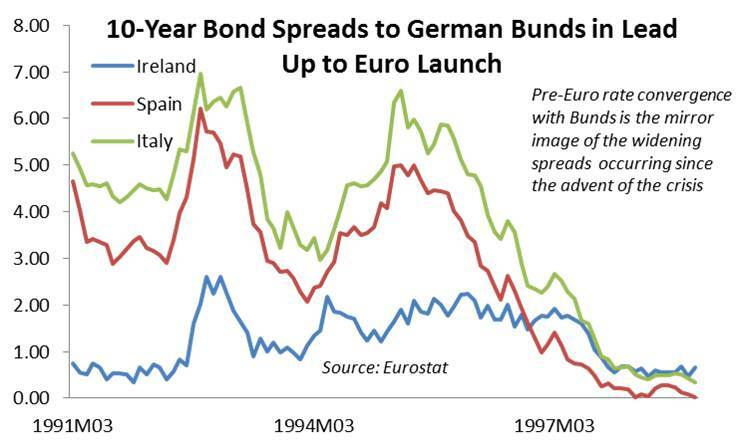 In the case of common Eurozone bonds, Germans would be implicitly responsible for the debt of shakier nations. With bond investors understanding that, the yields on German sovereign debt…the region’s benchmark…would rise accordingly, thus increasing the cost of financing for German corporate borrowers. 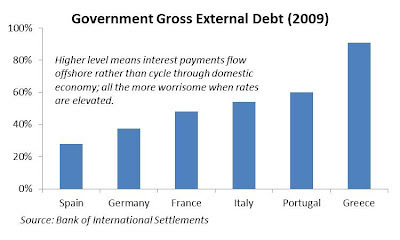 Should large-scale write downs of sovereign debt occur, as was the case with Greece, German and other northern banks would take significant hits, likely causing their respective governments to inject capital (i.e. tax-generated revenue) into the institutions. Which step would be most effective is further clouded by the need to choose the one that is most politically palatable. A challenging task after nearly two years of negative headlines and economic pain felt throughout the continent. Before shedding a tear for the Bundesrepublik, keep in mind that many German constituencies benefitted from the status quo. It is true that the country underwent painful structural reforms, including labor concessions and wage restraint to boost the international competitiveness of its manufacturing sector, but the country’s success also has been aided by having a currency weighed down by the inclusion of its spendthrift neighbors. Since peaking against the dollar in mid-2008 at $1.60, the common currency has fallen 22%. That has made German manufactured goods, which account for 86% of exports more competitive versus American and Japanese products. Without the albatross of the PIIG nations, it is logical that the Euro would be trading much higher, thus hurting the German exporters. Furthermore, 30% of the country’s trade is conducted within the Eurozone, meaning German businesses need not worry about an appreciating currency digging into sales. As inferred earlier, German banks’ revenues also benefitted during the decade as they extended credit to southern nations. The endgame and what have we learned? This crisis hits the average American’s radar when either there are vivid pictures on the news of Athens ablaze, or when U.S. equity indexes take a beating, as they have during the most recent iteration of the crisis (S&P 500 down 6.6% since April). It is also a key contributor to the current Treasury rally, which has seen the yield on the 10-Year hit a record low of 1.45% as investors seek safe assets. The boost to the dollar by this flight to safety has potentially created a drag on exports, a lone bright spot in America’s sputtering recovery. Reverberations through currency markets draw light to what may be a one of the larger…and more overlooked… channels of contamination to the U.S. economy. It has long been believed that Spain and/or Italy are too large to rescue. Therefore, this weekend’s events will test the EU’s resolve unlike any measures previously taken. Should efforts fail and weaker members be forced to exit the Euro, it is likely a smaller, northern-centric Euro will continue on. Let’s just call it the Deutsche Mark. Given the relatively strong fiscal position of Germany, the Netherland, etc., especially vis-à-vis the fiscally-challenged United States and Japan, the value of this currency would likely surge. Bad news for the Germans: it would hammer the country’s exports. Bad news too for the United States. With the spotlight off Europe, the bond market would turn its attention America’s fiscal brew. Ingredients include a 2011 budget deficit of 9.6% to GDP and gross public debt of 103%. Throw in a tepid recovery, the oft-mentioned fiscal cliff approaching in 2013, and the Fed promising to keep interest rates at rock bottom levels, the dollar would likely face unprecedented pressure. Whatever benefit seen by the nation’s exporters would be overwhelmed by imported inflation thanks to a sure rise in the prices of dollar-denominated commodities, especially crude products and industrial metals. Such a scenario would hit consumer and industrial users right in the teeth. Not what an economy struggling to maintain 2% annual growth needs. Further scrutiny of America’s fiscal position could accelerate the diversification of overseas central bank reserves, especially those of China. Emerging markets have continued to pile into treasuries and U.S. agency debt simply because they are largest and most liquid pools on the planet. But as America’s finances grow more tenuous, foreign investors will indeed seek other kinds of assets for their reserves. Once the market sniffs any hint of a tactical shift by the Chinese, there could be a race to bail out of dollar-denominated assets, which in turn would send U.S. benchmark rates higher, further hampering the economy. Larry Summers famously referred to this relationship as the balance of terror: China would love to diversify, but doing so enough to catch the market’s attention would see the value of its sizable U.S. dollar assets take a beating. In this respect the U.S., with a large share of debt held by foreigners is more like Greece than it is like Japan or Italy. Of course the U.S. could flip on the printing press (again) to inflate away its debt load, but that step, too, would import inflation. Underpinning the entire situation are questions regarding growth versus austerity and even more broadly, what type of economic system should a country adopt. For decades the Europeans have chosen a regime of large entitlements and an increasing role of the public sector in the economy. Arguably this has crowded out private players, resulting in weak economic growth and rising fiscal imbalances. Much of the jousting between the growth and austerity camps miss the mark. Increased government spending is mistakenly considered the lone source of economic progress. Absent from the argument is the fact that a private sector, unleashed from oppressive regulation and taxation, is the most effective way to marshal a country’s resources and grow GDP. This lesson is increasingly relevant to Americans as much of contemporary Washington believes that government initiatives are the source of growth and the private sector exists only to sheepishly carry out regulatory edicts on lending, energy usage, manufacturing and the types of products consumers purchase. Sadly the most transferrable lessons of the entire Europe crisis to the United States have fallen on deaf ears. Extremely well written and very insightful. What are your thoughts on the capital infused to the Spanish banks over the weekend? Thank you much. A rather relevant topic given your current location. My guess is although inwardly concerned, at least outwardly the Spaniards are appearing to enjoy life, eat tapas and drink Rioja. Regarding the bank rescue: it's interesting. This whole time we've been warned that an Italian or Spanish bailout would be unbearable. But here it is. Yes this is "just for the banks" but as I stated, bank junk = sovereign junk. I guess calling it one and not the other allows policy makers to cover their fannies, saying it's not that bad (always dangerous). Also by using the government to channel rescue funds to the banks...before the loans go bad and the government would need a bailout, allows Madrid to escape the much feared EU/IMF/ECB conditionality on finances. But in Spain's defense, it's been making tough decisions...unlike Greece. Next up Italy??? During my career as an investment analyst, several developments from the realms of financial markets, economics and public policy struck me as highly relevant, not to me in my role as a market observer, but in my role as a citizen. The subjects covered on these pages are not aimed at fellow investors or policy junkies, but to the broader population, which needs to recognize the shifts occuring in the economy and understand their consequences, as well as those of government policy.